Hi, I went down to the Joann's in Mt Laruel last week. Spent way to much money LOL. I purchased some Batman fabric to make a quilt for my niece's boyfriend. He is a BIG Batman fan. Now that I have the fabric, I have no idea what to make with it. Any suggestions? A Picture of the fabric would help. Is the print large or small? I think there is three different fabric, when I get home later, I will take a picture and attach it. I made a batman quilt with snow balls, fussy cut the fabric. I recently bought a pattern that I thought would be good for guys. It's called Boxtrot by Creative Solutions. It is a very modern geometric guy-type pattern. 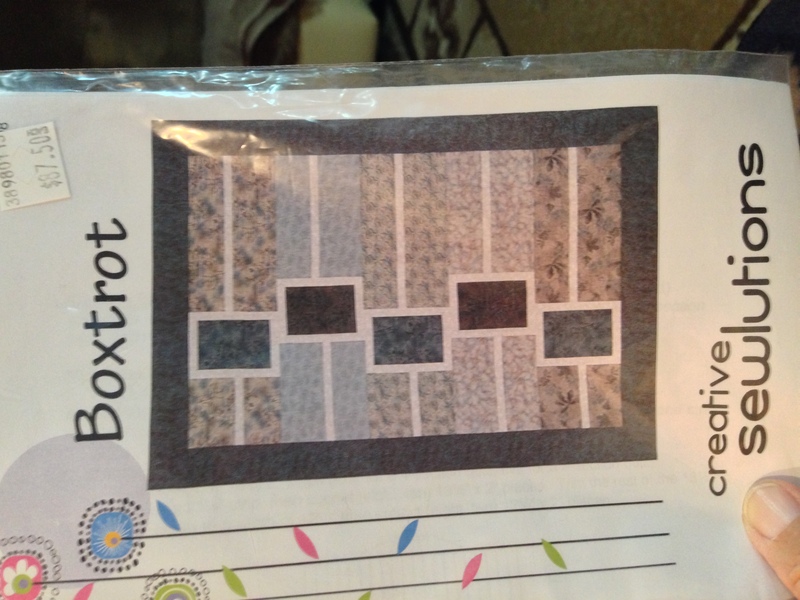 The sample I saw in the quilt store used the same focus fabric in all the boxes. Most guys don't really appreciate all those little pieces, although some do. OOPS! Not sure how to turn it...guess everyone will just have to look sideways. lol Kinda like my straight 1/4 " seam. Cute pattern! Could easily repeat the line of boxes if you wanted more too. I usually let the fabric do the design. 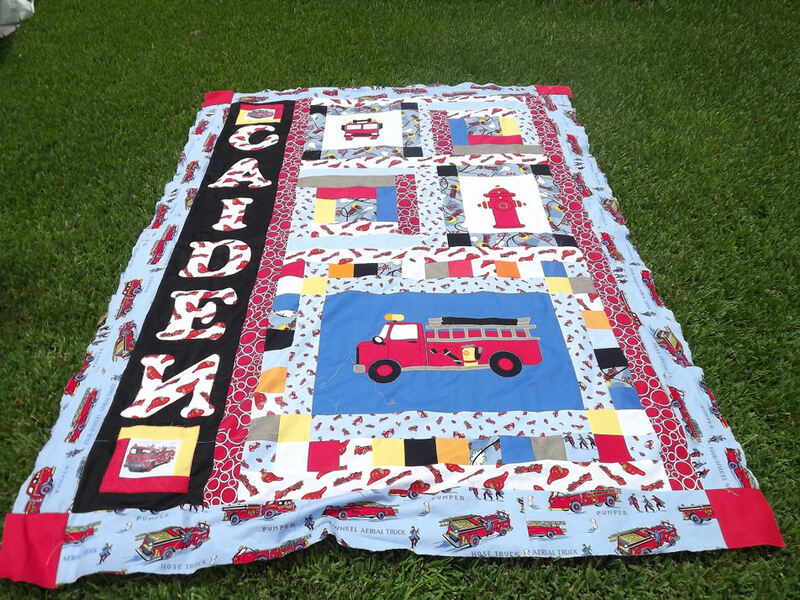 I'm making a quilt now for my grandson who loves fire trucks, the other one loves dino's. So purchased several types of fabrics with their love in mind and then just DAUG'd (design as you go). You can also go the Picture thread and search batman. You may get some inspiration. I just made this quilt for my DGS. Easy!!! Can make it as big as you want! 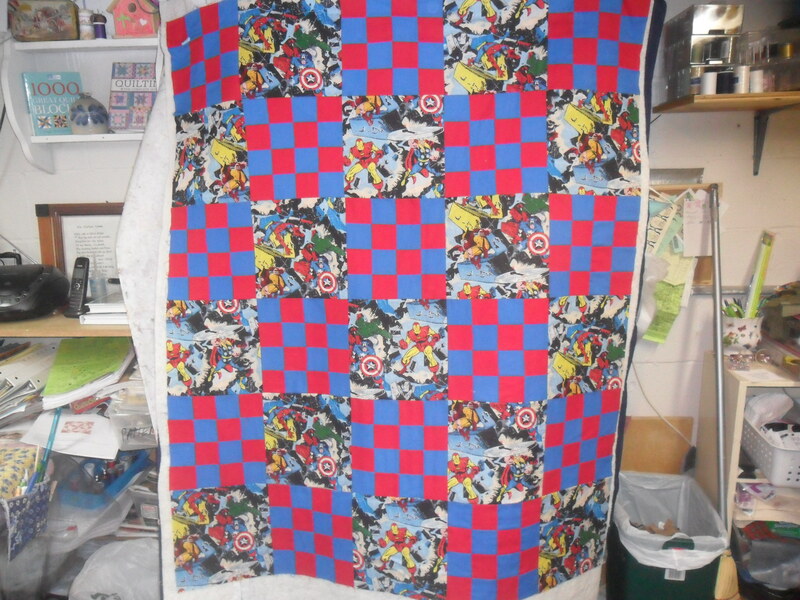 Fussy cut the fabric to show off superheros! Squares are 9" but can be made any size depending on size quilt you want. This quilt measures 45 x 54. I am not putting on borders. 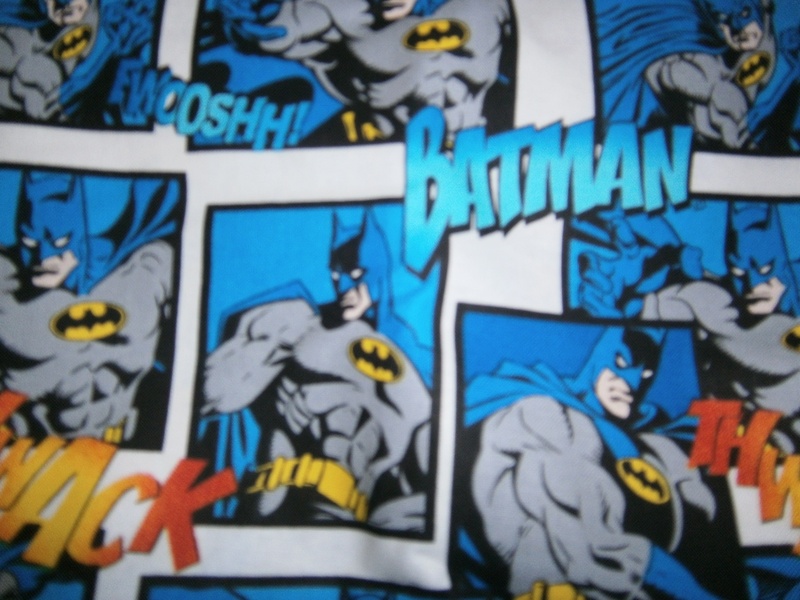 I purchased some Batman fabric las week down at Joann's in Mt Laurel, NJ. My niece's boyfriend just loves Batman, so I thought I would make him a quilt. I posted earlier this week and have been unable to post a picture from my home computer, so I hope my work PC works better. I also have red fabric with little silver dots, yellow fabric with red dots and circles and blue fabric with small dark blue dots. After I purchased all this fabric, I have no idea on what pattern to use. DD's first boyfriend was Batman obsessed... Could tell some very interesting stories about him, lol. Anyhow, I made him a Turning Twenty with Batman fabric and coordinating TOT's and textures in those colors. You're coordinating fabric sounds perfect. Sorry I'm no help with a pattern though. I'm one of those that picks a pattern first then works out the fabric! Just can't wrap my mind around doing the other way. I think I would fussy cut the second one and once you've done that play around with the rest of your fabrics and see what develops. Not exactly a pattern, but that's the way my mind works. Lol! 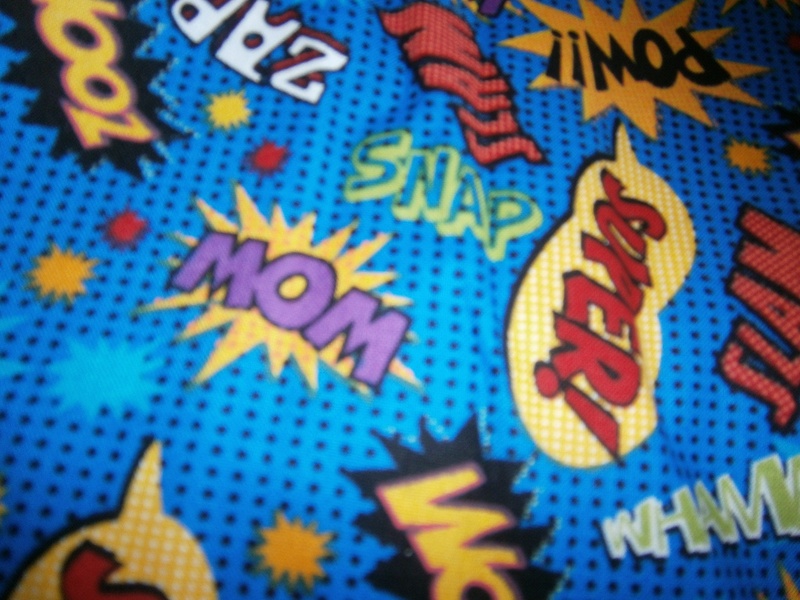 I like this pattern for using superhero fabric. I have this pic in my 'to-try' folder. 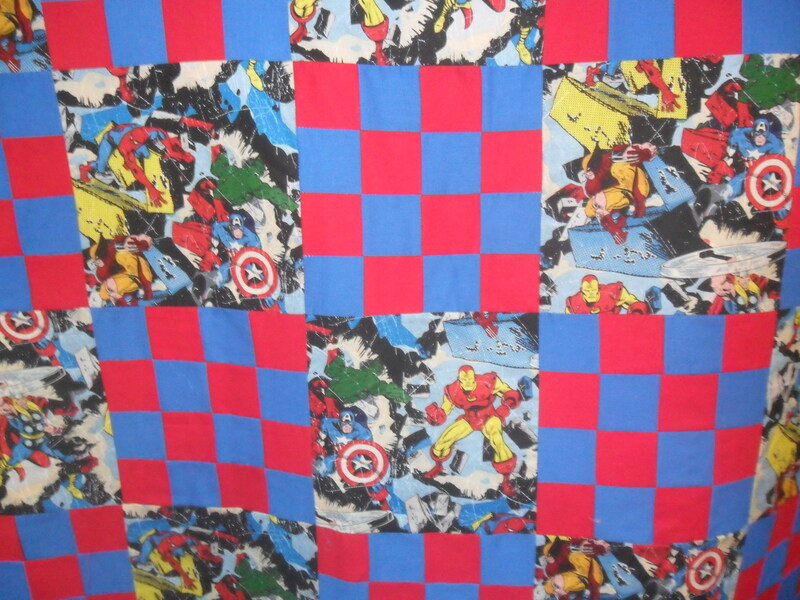 i made a great quilt of Super Heroes for my grandson and used the magic twist quilt that you can google online. Each of the dominant squares was a super hero. It was great and if I was at home I could send a picture. However basically it was the disappearing nine patch. Make sure that you do not cut up the superhero patch. I did a Batman top using alternate rectangles of batman fabric and NY city-scape. Just need to quilt it. Thank you Barb and Jaba for pm'ing me on my backwards N. So it is a great thing to post pic before the completion. No telling what you did wrong while working for 10 hours on a project. Going fix it now. Keep it simple and let the main fabric be the quilt. squares and rectagles, with some fussy cutting or if there are some super hero's which can be ouitlined, cut it out and applique it on a plain matching fabric. Since the fabric is very busy, I would do small blocks with it. 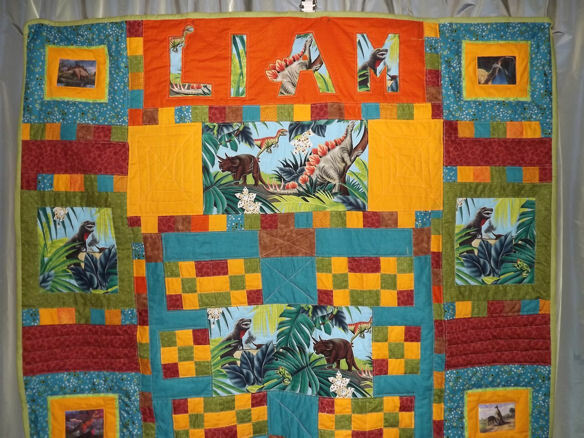 I did another quilt for my grandson with dino's where I cut a large piece and used it as one block (main block) and then outlined-quilted the dino's. Came out really cute. I messed up with my figures so some of the smaller coordinating blocks didnt' match, but he's 4 and he loves it. I am once again impressed by the QB people.. I went to "Js" also this week and got carried away Isn't it fun?! Love the suggestions, pictured and posted!! You all do such nice things and the help is so fantastic!! That is just adorable. Thanks for showing it. I might do some fussy cutting and applique some of the "figures" onto the squares, then use split rail squares in between. I have batman fabric at home I plan to cut into 9" squares and make a warm wishes quilt with three matching fabrics.